The 2019 Automated Weeder and Thinner Demonstration and Field day will take place on Tuesday, May 21, from 10:00 a.m. to 12:00 noon at the USDA Spence Research Field Station, 1572 Old Stage Road. Automated technologies are helping to fill the gap in the supply of labor that is occurring in the farming community. 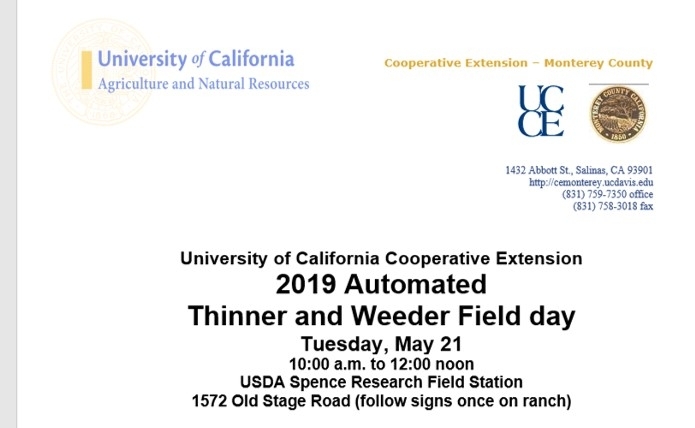 At this field day weeders and automated lettuce thinners developed by a number of companies will be demonstrated on lettuce plantings. Both driven and autonomous machines that use a variety of different mechanisms to remove unwanted plants will be available for viewing. These technologies are useful to both conventional and organic producers. Companies that will be represented include: Ag Mechtronix, FarmWise, Ferrari (Veda Farming), Garford (Quinn Tractor), Mantis Ag Technology, Naio Technologies, Robovator (Pacific Ag Rentals), Steketee (IC and Finger Weeders - Sutton Ag) and Vision Robotics. The meeting is organized by the Dept. of Plant Sciences, UC, Davis and the University of California Cooperative Extension, Monterey County. There is no admission fee and refreshments will be served. 2.0 Continuing Education Credits have been requested. For more information call Richard Smith, 831-759-7357.